Best Friends Animal Society, located in Utah, operates the nation's largest no-kill sanctuary for companion animals, providing care for anywhere from 600 to 700 dogs on any given day. Their mission is to bring about a time when there are no more homeless pets. Learn more about this extraordinary shelter and its very special program. Elissa Jones, manager of the Best Friends Animal Society shares important info on the Guardian Angel Program and why it's needed so much. Please tell us about the Guardian Angel Program. The Guardian Angel Program at Best Friends Animal Society helps provide top notch care for special needs animals who arrive at the sanctuary or become ill while living there. It's really about providing care to the animals who need it the most. For the past year, Best Friends has had a special section of the website, Guardian Angel, that is dedicated to showcasing the special care provided at the sanctuary, the people who provide that care and a handful of the animals who receive that specialized care. On the website, we tell their stories in an ongoing fashion, week by week. People can follow their stories from the beginning, watch their progress, and even apply to adopt. Some animals recover quickly and don't need to stay at the sanctuary for the rest of their lives. This is why we don't ask people to sponsor them individually. The Guardian Angel program is really about helping animals get the extra care they need when they arrive, whatever (care) that is, getting them back to good health, and then placing them in good home. We continue to follow their stories even after they've been adopted! Where do the dogs in the program come from? The dogs in the program come to Best Friends from all over the country; from groups who are unable to provide them what they need and request assistance, from disasters like Hurricane Katrina, and occasionally they are dogs that have been abandoned and come to Best Friends from that avenue. We have a veterinary team on staff who provide most of the care and surgeries, but they also consult with specialists as needed. We also have on staff four dog trainers and Sherry Woodard, a dog care consultant who travels the country, so we are able to provide a higher level of care than shelters with fewer resources. What qualifies a dog as having special needs? Special needs can be anything that keeps a dog from being "adoptable" in another sanctuary or shelter environment. Most of these dogs have suffered serious physical or emotional trauma, or have painful or debilitating conditions that can require expensive medical care. Some have missing limbs or partial paralysis, some need a cart to get around, some need surgery that they will recover from given the necessary time and care. What are the most common illnesses/injuries you deal with at the sanctuary? The most common surgery performed in our clinic is a cruciate ligament repair surgery, which is then followed up with hydrotherapy. We also receive dogs with very painful skin conditions that are typically difficult to diagnose and treat, but given time, care, and medical attention these dogs can go forward to have wonderful, healthy lives! During our rescue work after Hurricane Katrina we took in many dogs with severe heartworms, not something we usually deal with in the Utah desert. We learned a lot about this condition and treated so many dogs, seeing them through this painful and preventable illness. What other routine veterinary care is provided by Best Friends Animal Society? We provide Spaying/Neutering for both surrounding shelters, low income households, and sanctuary animals. We also provide emergency care, surgeries, dental care and extractions, x-rays, acupuncture, hydrotherapy, etc. Basically the same care you'd find in a veterinary clinic. Please share with us one of your most memorable case histories. 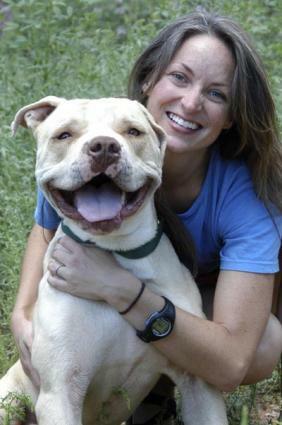 One of our most difficult and rewarding cases was about a Pit Bull named Dermott. Dermott came to Best Friends as a puppy who appeared to have been malnourished, and had very deformed back legs. After five surgeries with an orthopedic specialist, hours of hydrotherapy and massage, and lots of love, Dermott still walked a little funny and his back legs didn't bend well at all, but he could move, run and play. After two years in our care getting him as physically fit as could be, Dermott was finally adopted into a wonderful and loving home, where three weeks later he died very unexpectedly of an aneurysm, or heart attack. Although his death broke our hearts, and I wish so much for his new family that they could have had him longer, Dermott lived a beautiful life, and he truly taught many people who read his story as well as teaching me to LIVE. Live in the moment, enjoy your blessings. It's okay for life not to be perfect - it's ok for your own body not to be perfect - just live! How do you decide if a special needs dog is ready for adoption? If they are in the program for medical needs, as most are, we discuss their progress with our veterinary team. If they are in the program for behavioral rehabilitation, we discuss it with our trainers. We really look at each individual dog to help them get well, reach their potential, and ultimately find them a wonderful, lifetime home. What criteria do you use to determine who can adopt one of these pets? The dog must be a member of the family - not living alone in the back yard. We want our dogs to have a better life in a home than we can give them at the sanctuary. We look at the individual dogs and determine what they need in a "forever home" and try to find just the right match. If the dog has a medical condition that they will have for the rest of their lives, we look for homes that are willing and able to take that on, financially and emotionally, and make a true lifetime commitment to the dog. Are there adoption fees involved? There is an adoption fee of $95 for each dog. If the dog needs to be transported to a home out of state, additional fees may be involved to pay for the transport. How should someone interested in adopting a special needs pet go about contacting Best Friends Animal Society? How can someone help support the Guardian Angel Program? Thank you for sharing with us today. Is there anything you'd like to add? Yes. The dogs that come to us are often the dogs nobody else wants, or that may seem like too much trouble to care for, but we think they deserve so much more than that.We are really hoping for a time when people see "special needs" pets as really just "special", and that it's OK for an animal to be "different". We want everyone to realize that these dogs don't have to be "perfect" to have a perfectly wonderful life!